My name is Ben Zenger. 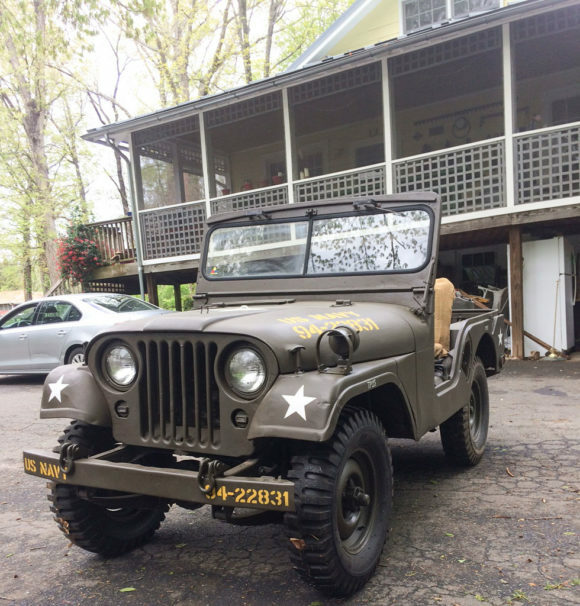 The following is the story of how I became interested in Jeeps, saved my money, then purchased and restored my 1954 M38A1. All by the time I got my drivers license in February, 2017. To start from the beginning, my dad has always been into Jeeps. 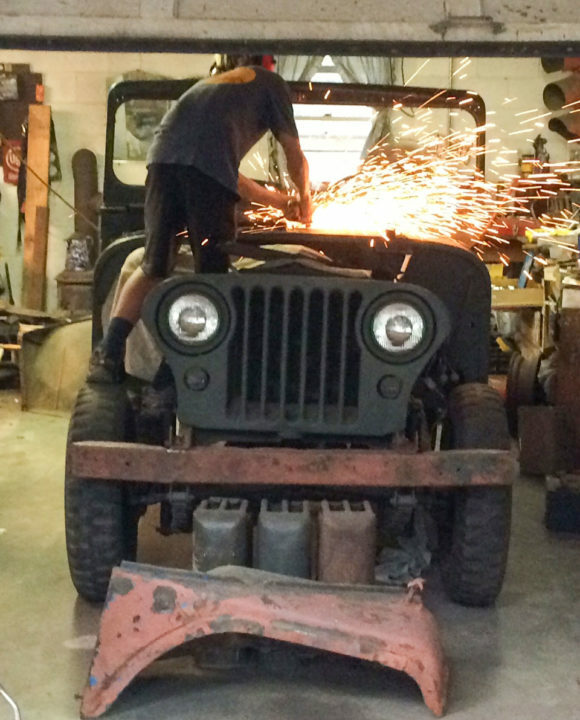 He’s run CJ-5’s, CJ-7’s, M38A1’s, M38’s and a CJ-8 Scrambler with his good friend Tom. 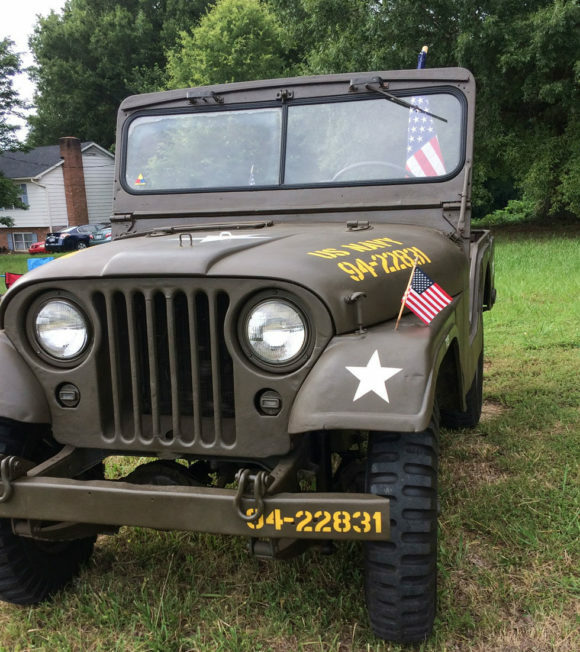 So, after finding his passion for Military Vehicles and Jeeps, he attended the Aberdeen Proving Ground Show for many years. Several times he took an M211 Deuce and a half that he used to own. So naturally, in the spring of 2009, he took me to the Aberdeen Show with our good friends the Stones who also share the old Jeep / military vehicle addiction. When we got to the show, we walked around to see all of the vendors and vehicles. Soon we came to Jeep row. As soon as I saw the MB’s, GPW’s, M38’s and A1’s, I decided that I would definitely have one at some point. Later on we saw two A1s parked next to each other that needed to be restored. 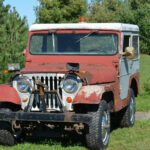 After looking at their condition, I decided that when I got home I would begin saving for a Jeep to restore of my own. So when we got home, I put $27 in a mason jar with a piece of paper on it that said “Willys Jeep Fund”. I told my parents that I would have a Jeep on the road by the time I got my license. Pretty much everyone who heard about my fund thought I would give up in a few months, being an 8 year old with no income. I set to work building birdhouses and selling them on the side of our country road. By the time I was 11, I had saved $1100. I told my dad it was time for me to get a Jeep. My parents were in disbelief that I wanted a rusty old Jeep so bad. So my dad called a friend, who we knew had a CJ-2A and an MB. But he didn’t want to sell it. He referred me to a guy he knew trying to sell a 54 A1. We went out to his place and he wanted $900 for it. It was broken down, it had been rear ended at some point, it didn’t run, but it was an M38a1 with a title. I, an anything but humble 11 year old walked right up the man and offered him $600. He took the money, mostly because it was in 10’s and 20’s and he could tell I had saved it myself. So we took it home. I had no idea what I was doing. I could remember the title “M38A1” long enough to tell my friends. I didn’t know how an engine worked, or anything else. So with some help from a friend, we got it running and I drove it around the house with no brakes. (I learned how to drive stick shift on a 55 CJ-5 owned by a friend when I was 7, so I knew what I was doing.) 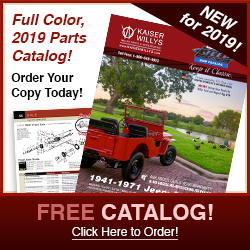 I rebuilt the brakes, with parts from none other than Kaiser Willys Auto Supply. I rebuilt the carb, installed a new fuel pump, and spent every second I had in the garage sitting in it and polishing the disgusting metallic paint someone had painted it. Soon I bought a parts Jeep, as mine had been converted to 12v. 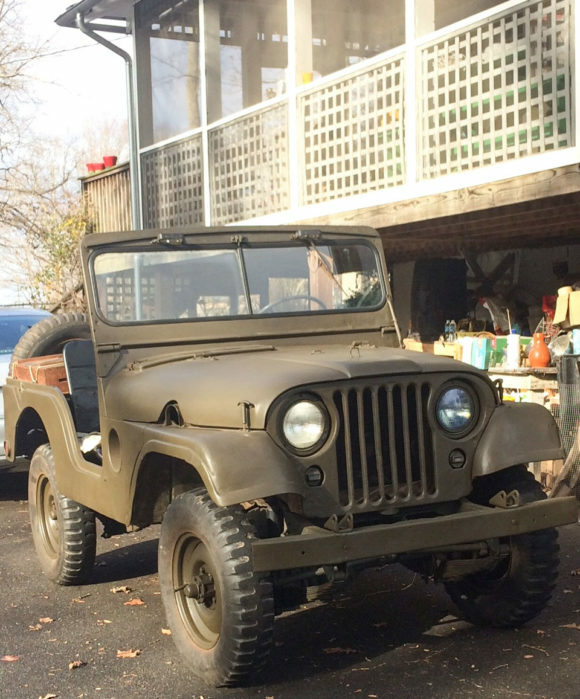 The parts Jeep was a 52 A1, with all original parts. 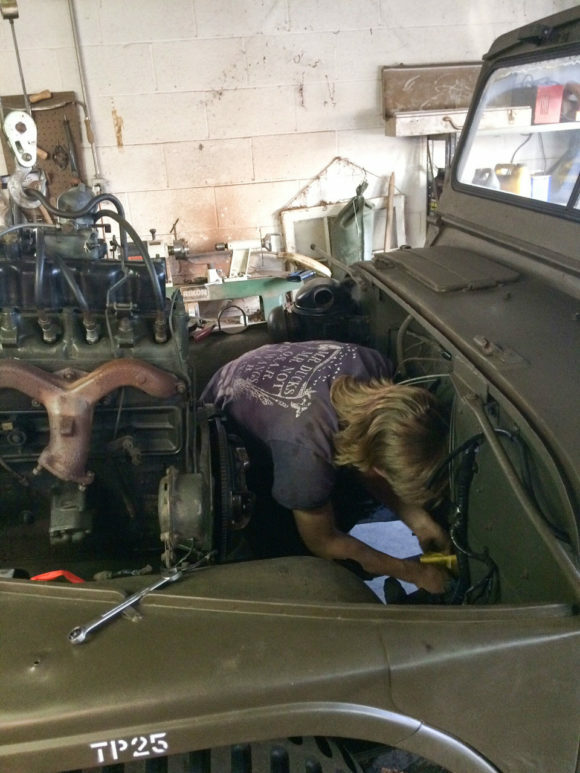 We pulled the body off my 54, and I got to work. 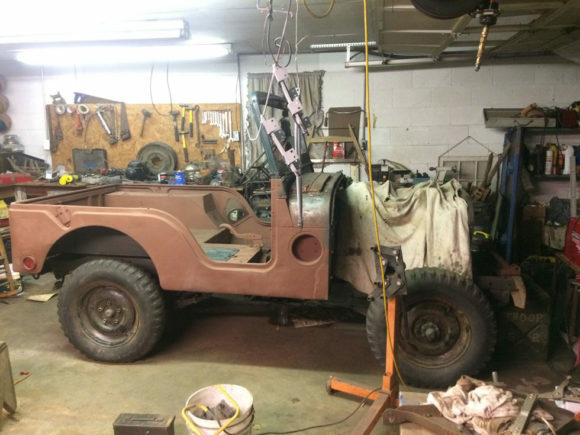 Restored the frame, new leaf springs, and used the engine out of the 52. I learned how to rebuild the transmission and transfer case and did that, and got all the water proof 24v parts installed. I learned how to weld and fixed all of the holes on the body, including new floor pans and a new battery box. 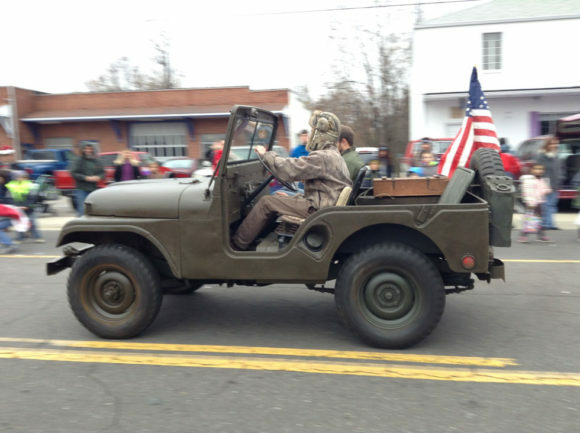 Eventually I painted it in the fall of 2016, bought new tires, installed the windshield glass myself, and took it in the Lewisville, NC christmas parade for its first run. I finished the odds and ends, and put it on the road in February, just one day before I got my drivers license. I drove it as my daily driver to local classes, and although it was not fast and not practical, I loved every minute. I got the correct Navy markings back on it that I had found under the newfangled metallic paint, and took it to the Aberdeen Show this past spring. 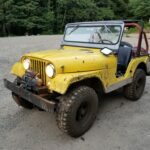 Now, I have a 44 GPW I’m working on, a 1960 Willys Wagon, an 86 CJ-7 as my daily, a 75 CJ-5 that I am flipping to finish my GPW, and an 85 M1009 CUCV blazer. The addiction has overcome me, and I couldn’t be happier. I financed the entire restoration myself. 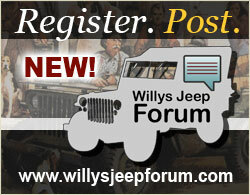 I am attaching the links to two articles written about my Jeep in the local paper. I now know Jeeps like I know how to put on pants. 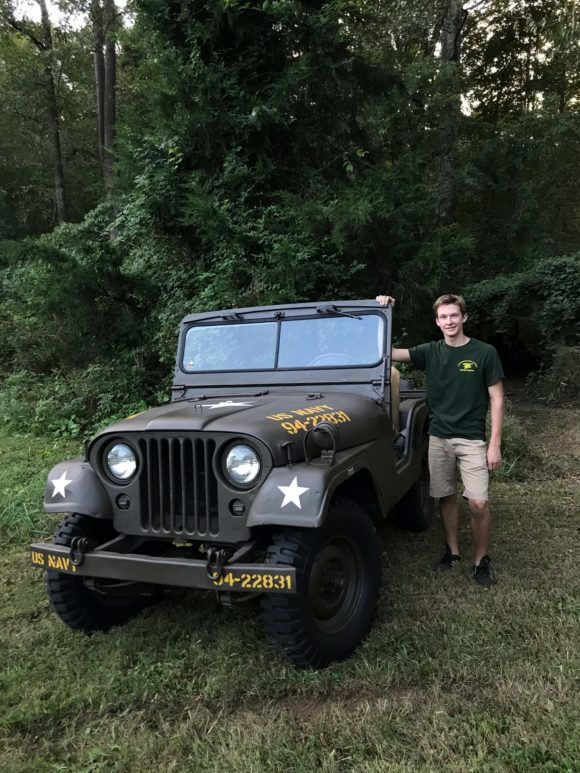 I hope to attend the United States Naval Academy class of 2023 if I am accepted, and I will never stop Jeeping. I am now 17 years old and live in Lewisville, NC. 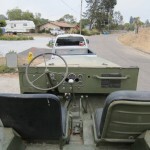 My father bought a 1951 CJ 3A in 1968 and I drove it to and from high school my junior and senior year. It remained with my parents at their home In Napa, Ca while I served in the navy. My folks passed years later and the jeep sat rarely used until I put it on a trailer in 2017 and brought it to my home in Washington state. Two months later my late folks house was a total loss in the “atlas fires” of October 2017. But at least I have the jeep. It is in a shop now being made driveable (some front end tweaking). I hope you are successful with your Naval Academy appointment. I am class of 1973 and I would be your legacy classmate that being my 50th year reunion. I was a helo pilot and loved every minute of my 22 years. Our class motto was, “Non Sibi” which means not self. The academy motto is “Ex Sciens Tridentia”. Through knowledge seapower. 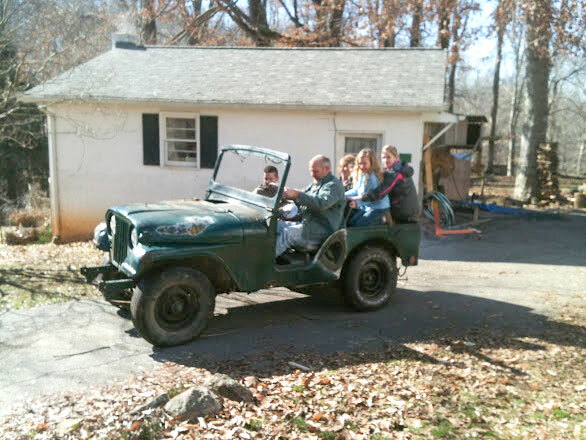 I have Two boys kids, (Leonardo 13) and (Murilo 8) and every time they have a chance to ride in our 54′ CJ3-B jeep its a great experience for them. I hope some day they must have a chance to restore your own Jeep like you do so well, good luck ! Outstanding dedication, discipline and hard work!!!! Before I could drive decades ago I did the same and bought a CJ2A in similar condition, using paper route, lawn mowing and farm labor income, $400. 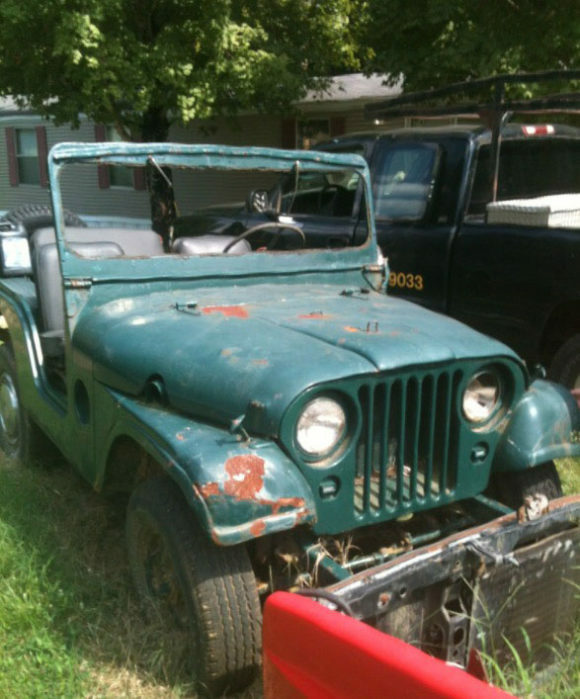 At that time a new CJ5, unassembled from Toledo, was about $1300 as I recall. My Dad was a WW2 motor pool guy in China and a high school ag teacher. He taught me about working on cars as we rebuilt it, a forever experience that has helped me countless times since then. Cheers to you and your family on this project, it will forever help you in life!!!! Great job restoring your A-1. the off roading of those vehicles depends entirely on the drivers ability, and common sense. they will stand up to extreme stress if you do it slowly, avoid soaking in wet environments and don’t drive like you have no brains. Watch those who are successful drivers around you and take the advice of those who are not foolish and wasteful. It worked for me. What a GREAT story and pictures. Thanks for making my day ! The country needs millions more like you ! Great story; I love the 38A1`s. I have had three, and have one in the shed now to fix. Good to see a kid who wants to get his hands dirty instead of playing video games. Good luck on you future dreams. Great job! Fantastic story! Do you hire out? 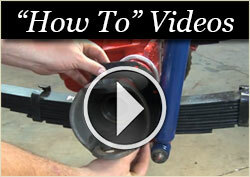 I am worried about replacing a carb with a new one. I will share this with my dad (a WWII vet – he will love it). 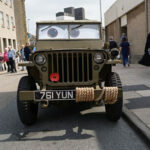 What a great job and a great story your Jeep looks fantastic. Good luck in the future. Huge passion, it reminds me of my obsession when I was 20.. manage to rebuild and have an M38 1952 and now I have 3 M38’s, plus a 56 Pickup, also the FC-150 Truck and, 1 M38A1., 1 Jeepster 1948 … finished the collection with a 69 Wagoneer. All reconstructed by me, mechanics and painting only with 2 hands and the spirit Willys inside me. from Chile a big hug. Felicitaciones Ben!!! Gran logro y mérito tu trabajo!! Te quedó muy lindo!! Good job Ben stay with it. I am not quite as old as some of the previous writers, but a Navy veteran serving in two wars. 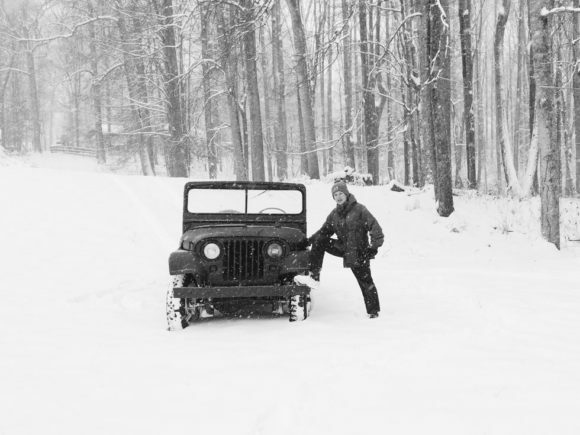 Likewise, I own a 1947 Willys CJ2A. 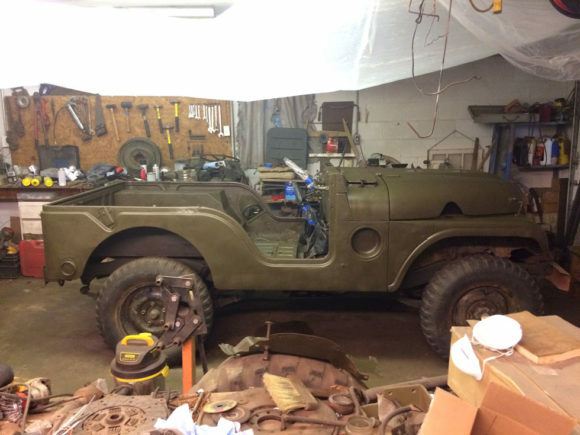 I am in the process of a frame restoration and converting it to a Navy jeep. I didn’t understand why the Navy never had a standard paint but found out we “comshawed” (sailors don’t steal) them from our buddies. (Marines and Army). Hopefully, I’ll have it completed in a couple of years. staring retirement next year and will have more time to work. I’m 86. Restored a 1951 M-38 back in the late 60’s. Still own it. 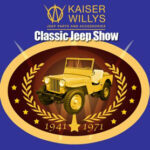 Have always loved jeeps, since 1941, as a kid. 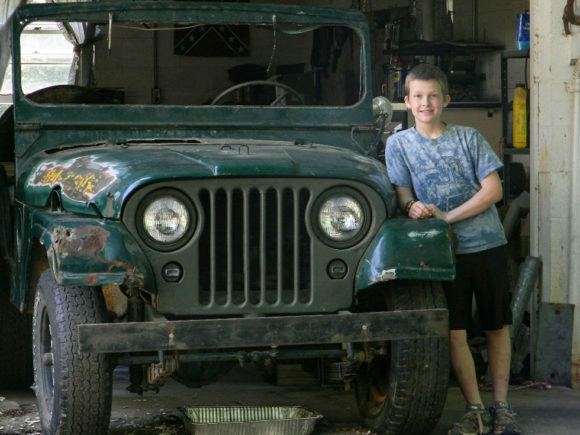 You’ve done a GREAT job on your Jeep & a great example for kids of to-day follow. I’m sure your family is very proud of you. I have 2 grandsons that graduated from the Naval Academy, and now fly airplanes for our Navy. Looks like you do good work, with research before you start. Keep up the good work. 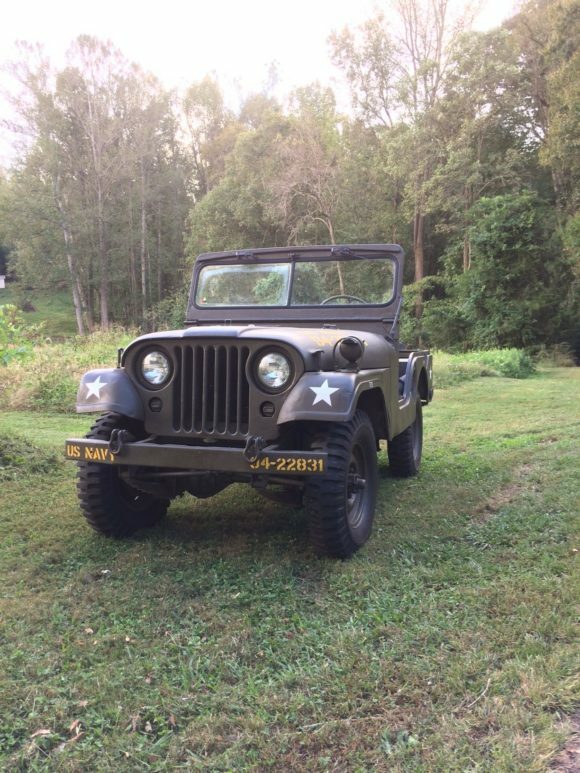 I have a 1954 M38A1. Great job on yours. They are amazing vehicles. That is an awesome story, Ben! Congratulations on your dedication and especially on your cool Jeep. 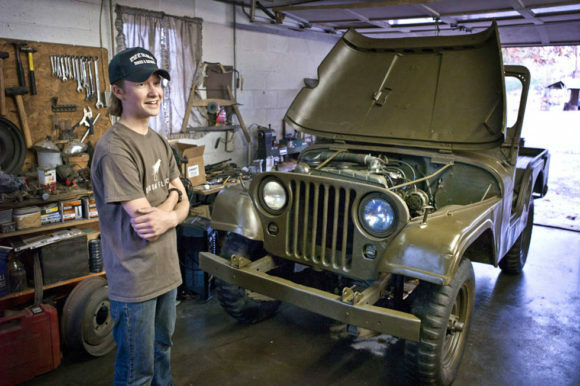 This is one of the best stories about a kid and his dream car that i’ve ever heard. Mine is similar in that I saved my money to buy a 1946 Studebaker in 1964 to have something to drive to high school. It soon became the donor for a “dune buggy” in which to crawl the Everglades. Shortly afterwards I purchased a 1949 Jeepster to beach cruise the west coast of Florida while attending college. 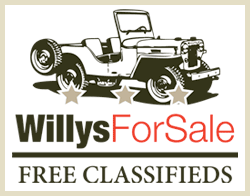 With marriage, Army, children and career, I had to put off jeeps and cars until while attending a friends funeral, his wife told me that she was interested in selling her husbands 1951 Willys Station Wagon. 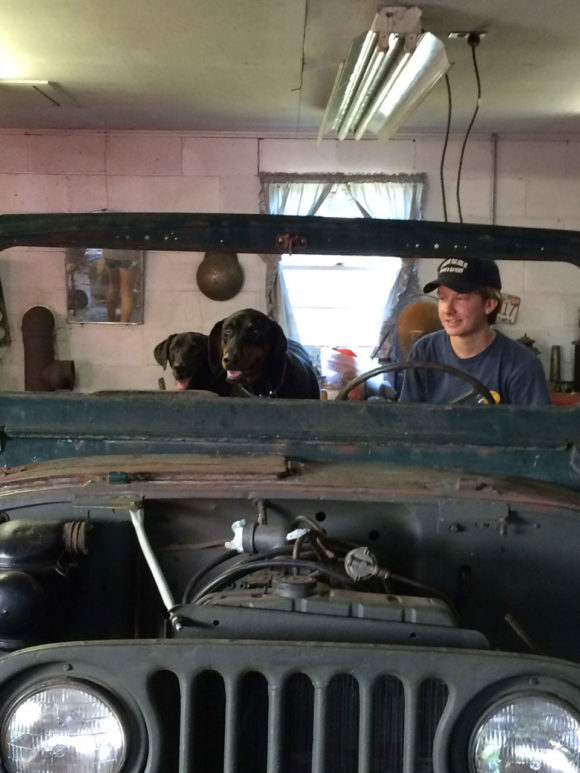 After much discussion and promises to my wonderfully understanding wife, the Willys took up residence in our garage. During it’s time with us, I was very involved in building and driving streetrods. After many years of working, retirement came about and with it came that evil event “Downsizing.” I had to sell or give away years of beautiful rusted patina and Detroit delights. 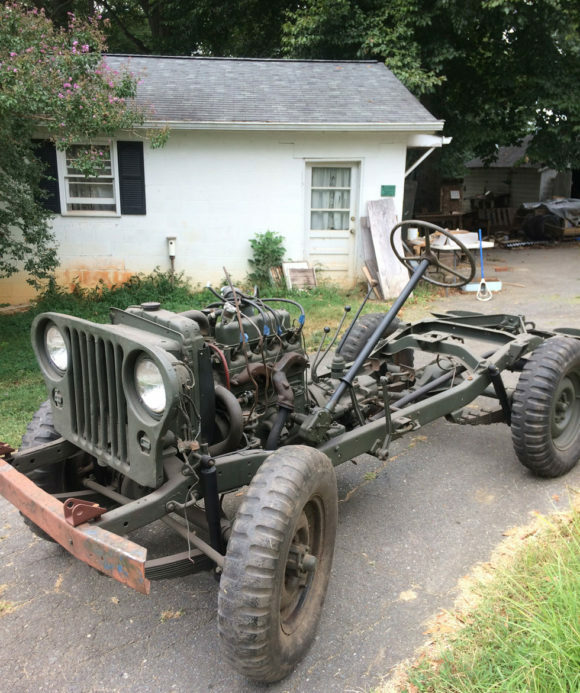 The only thing I kept was a 1928 Ford Model A but……I think I envision another Willys or Jeep taking up residence in my garage again. 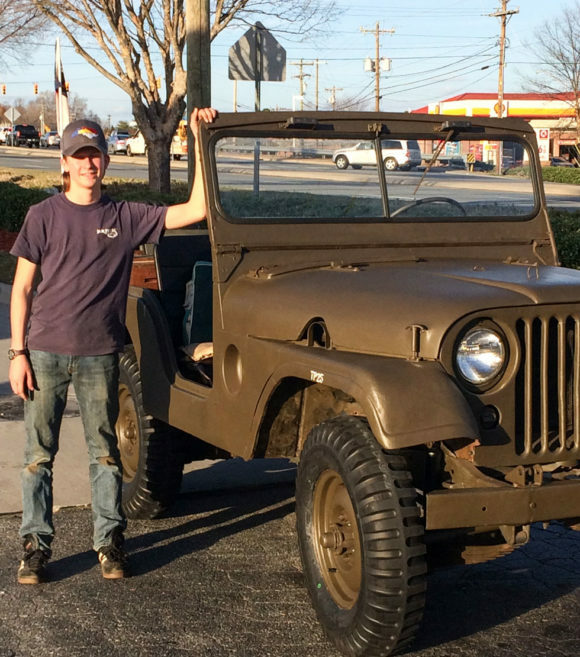 Ben and his Jeep are a very heartwarming story, for a 71 year old car guy, that stirs up great memories and past joys of wrenching, welding, sweating, and loving on old cars, trucks and Jeeps. Good luck Ben and remember, keep that first project if you can. There is only one first. Great job young man! You enjoy that awesome piece of history for a long long time! !